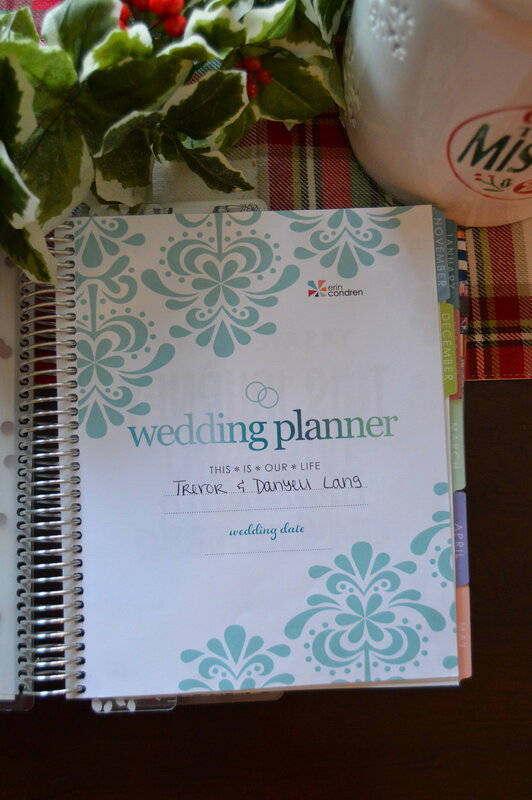 One of the very first things I did after Trevor popped the question, was get a planner. I knew that I couldn't do this by myself, and needed a little book to guide me through the process and help make sure that I didn't forget anything. I ordered this Erin Condren planner off their website the very next day. I was able to customize the cover by choosing the design that I wanted and adding in my future monogram/initials at the bottom (DNL)! The inside all comes the same, but it has literally everything that I need. The very first part of the planner are monthly calendars. I use this to mark down anything wedding related, as well as, some personal things that I want to take note of so that I can remember that I have these personal events going on if I were to start any wedding planning. I use the Erin Condren stickers at the back of the planner to keep track of specific wedding things like appointments, dates to remember (for example, I marked when we finalized a few things so that I would remember those dates), when money is due, and more. The other portion of this planner is mostly for to-do's and lists. It has specially segmented to-do lists that are supposed to help you schedule out different things during different times before your wedding. For example, I just wrapped up the '14-9 months before' portion of the to-do list and accomplished everything that I was supposed to do during this time frame. There are also list/guidance pages where it helps you plan things like your music choices, pictures needed, flower arrangements, alcohol, etc. It's really good to keep you organized and focused on the important things on a larger scale, and then dive more into the details as time goes on. The final half of the planner is mostly just notes pages. I might be using these as my Wedding Day sign-in, but I haven't quite decided yet. I like the idea of keeping everything in my planner as one solid scrapbook, journal, memory-keeper that I will have for years to come. I write little journal entries about how I'm feeling or how the planning process is going, and I plan on sticking pictures in there too! I think we're doing really good on the planning so far. Essentially all of our wedding is planned out in terms of me knowing what I want, I just need to finalize details and logistics. We have our venue booked--which is one of the first things that I did. I wanted a venue that felt homey to Trevor and I, and made us both feel comfortable. Once we found the venue, everything else could start falling into place. The details really revolve around the venue, and I am glad I was able to get a place that was perfect to me. We also have our officiant booked. Our photographer booked. Our DJ booked. Our wedding party planned. Our save-the-dates planned out (but not yet made). And our food planned (but not yet decided on a caterer). I don't really want to share all of the details about everything that we have planned because I want to leave the final stuff for my family and friends to see on the big wedding day. Like I said though, things are going really well. I'm a little nervous about a few things--like flowers, for some reason flowers are really stressing me out--but for the most part everything is going well. I'm more of an overarching planner, and I struggle with the small details, but I'm really going to have to push through and get better at that so that I can plan this wedding!